In the recent years front-end development has evolved from simple tasks like “upload files to FTP” to complex build processes including minification of CSS/JS, expansion of SASS and LESS, and more. These tasks can be coordinated with tools like Gulp and Grunt. Tools which help you manage the process, but on the other hand add to the complexity of the workflow. This is why we created Buddy: to help developers manage, optimize and automate their workflow, or, in other words, introduce Continuous Delivery to their projects. Part 1: Generating webfont from SVG files - where you will learn how to create webfont from SVG files using Gulp.js. Part 2: Automating Gulp tasks with Buddy - where you will learn how to automate the Gulp processes so that Buddy will execute your Gulp tasks every time you make a push to the repository. First, we need a few icons in the SVG format. You can use Illustrator, Inkscape or another vector-drawing tool. For this example I shall use icons from the Maki Icon Set. Once you apply these settings to all icons, you are ready to create the webfont. In general, package.json contains information on the npm libraries used in the project, so that you don’t have to install everything manually every time you pick up the work on another computer. The main parts of our script are gulp and gulp-iconfont, but we will use two other dependencies, gulp-consolidate and underscore, to create HTML and CSS files from prepared templates. This way we’ll be able to generate classes in the CSS, or variables in the SCSS. First we grab all SVG files from iconfont-src/svg/. This is the main directory where you should put all SVG sources. Next gulp.js creates webfonts in 4 formats: ttf, eot, woff and woff2. You can modify this part to your desired extensions. The rest of settings define font rendering. You can experiment with these options to your liking. When the font’s been generated, gulp.js triggers the glyphs event which saves font character codepoints to CSS file and HTML demo page: iconfont-src/iconfont.css and iconfont-src/index.html. The gulp file defines all font data. It will be used as an underscore template. The CSS template is the most important, because it will be used as the main part of our website. Remember that this is only source and all results will be placed in the iconfont directory. The second template will show all icons with codepoints and CSS classes, making it easier to view the results. You don’t need to create it, but it’s very useful for development. In this part we’ll show you how to automate Gulp processes with Buddy on the basis of the previously described SVG-to-webfont task. If you haven’t configured the Gulp files from the first part of this guide, you can download our sample project with the preset Gulp tasks here. First we need to set up a repo for your files: having your code versioned in a sound repository should be your first and most important priority as a developer. For this purpose we shall use Buddy’s fully featured Git hosting with merge requests, branch management and web code editor. If you haven’t used Git hosting before, this tutorial will walk you through the basics. Alternatively, you can download our Gulp project where the files from Part 1 are already prepared and use the Import option in the right column upon creating a new project. Buddy also supports GitHub, Bitbucket and GitLab as Git providers: just choose the service that you use when creating a new project. If you’re a GitHub user, you can fork our Gulp demo project from https://github.com/buddy-works/buddy-gulp-iconfont beforehand. The repo with SVG icons and config files is set: now we need to build the webfont from it and deploy the results to the server. Buddy allows you to perform these tasks using its core feature: pipelines. Pipelines are series of actions that represent your workflow (builds, file transfer actions, notifications, etc.) triggered manually, recurrently, or automatically on push to repo. You can read more about pipelines in this awesome guide. 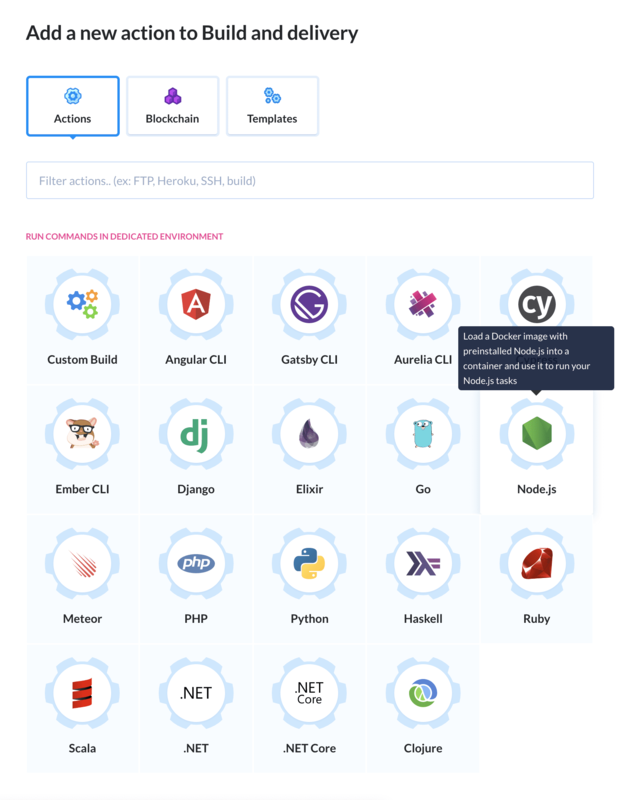 Our pipeline will build webfont with Gulp and deploy it to an FTP server every time you make a commit to the repository, so that the newest version is always available at hand. 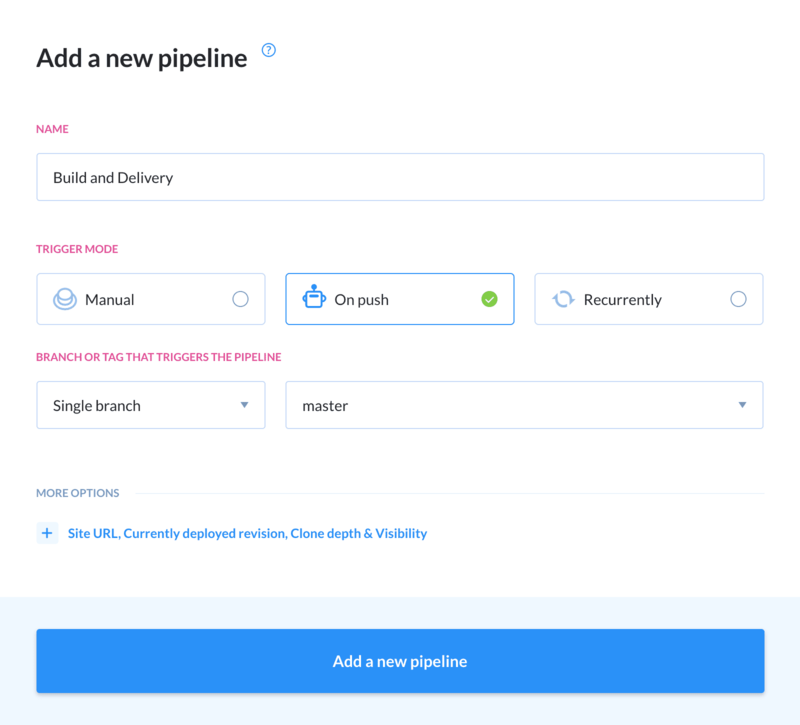 Create a new pipeline, set the trigger mode to On every push, and select Master as the target branch. This way the webfont will be automatically generated every time a push to Master is made. (Optional) Click More options and paste the URL to your website to quickly access it from the pipeline view. 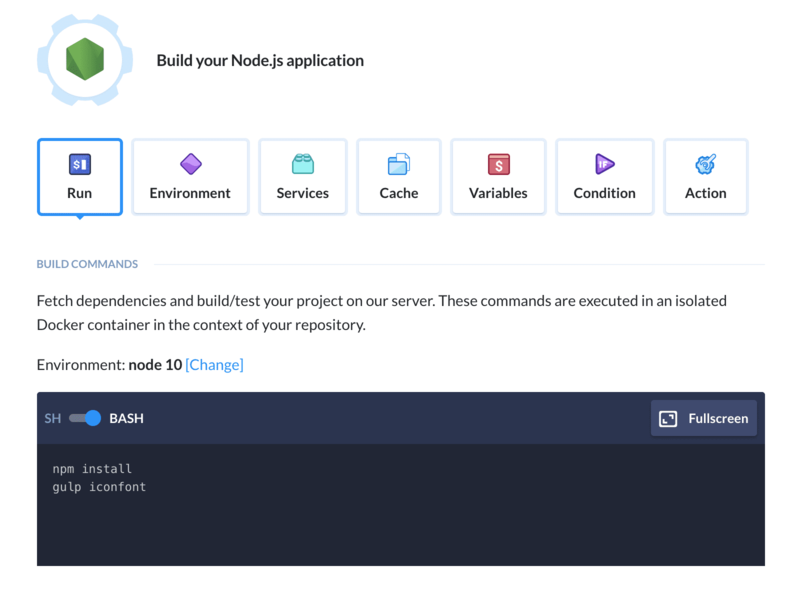 Gulp requires Node.js to run so we need to install npm package manager first: select the Docker container with pre-installed Node.js. This Docker container with Node.js comes with npm install -g gulp predefined, so there’s no need to install anything else. On the action setting screen, select the Pipeline Filesystem as the source so that Buddy knows it has to deploy the fonts generated by Gulp actions along with repository files. Provide login details to your server and set the source path to iconfont. It contains all webfont files (we set this path in gulpfiles.js). Remember to use correct paths to your CSS and webfont files! From now on, any time you need to add a new icon on your website just put the SVG file in the iconfont-src/scr directory, and Buddy will take care of the rest. invite more people to your workspace and add notifications to keep them notified of the progress. And if you ever get stuck or need advice how to get things going, drop us a line at support@buddy.works and we’ll get back to you in a flash with a bag of tricks. Run Gulp tasks and deliver the results to the server on every push to Git.